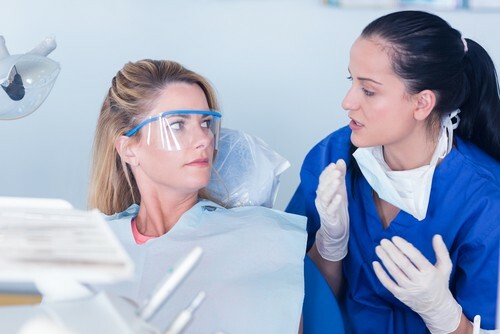 We typically recommend our patients visit us at least two times a year to have a dental checkup, professional cleaning, and sometimes digital x-rays. These appointments allow us to remove any plaque or tartar that may have built up since your last visit as well as monitor your oral health so we can catch and treat problems early. But these bi-annual visits are only half of what it takes to keep a mouth healthy. The American Dental Association (ADA) and your dentist in Douglasville recommend brushing your teeth twice a day, everyday, with a soft-bristled toothbrush and using gentle circles. It’s also critical to floss once a day to remove food particles and plaque from between teeth. Scrubbing your teeth may seem like a good idea, afterall, brushing harder must remove more plaque, right? Not necessarily. Brushing your teeth roughly can remove food particles, bacteria, and plaque, but it will also damage gum tissue and eventually cause it to recede. Once gum tissue recedes, the teeth appear longer and sensitivity tends to increase, making it difficult to enjoy some of your favorite cold or hot treats. If it’s time for your bi-annual dental cleaning and exam, call our Douglasville dental office to schedule an appointment. As we all gear up to head back to school, loading up on folders, notebooks, pencils, and backpacks, the team at our dental office in Douglasville wants to send a friendly reminder to our patients and neighbors about the importance of getting your child (or yourself) to the dentist before school starts. Following a proper hygiene routine and maintaining appointments with our Douglasville dental office can keep you and your child smiling and in good health all the way through to summer break. If you’re looking for a Douglasville dentist, schedule an appointment today!